Poppy and David Shell initiated the pickleball games at the Silverton Community Center. A fun way to beat the winter doldrums can be found at Silverton’s YMCA. “Pickleball,” a sport with an odd name and originating from the Pacific Northwest, has found its way from larger cities to Oregon’s Garden City. Think of it as a kinder, gentler tennis game. Introduced on Dec. 27 at the Community Center, the paddle sport combines elements of tennis, ping pong and badminton – and uses a badminton-sized court and modified tennis net. However, scoring is not like tennis. The first team to reach 11 points (by two points) wins. Invented in the mid-1960s as a children’s backyard pastime, it was first played officially in 1965 in Bainbridge Island, Washington. While its true origin is open for debate, entertaining theories abound. “One story tells of a few men sitting outside with some bored children. 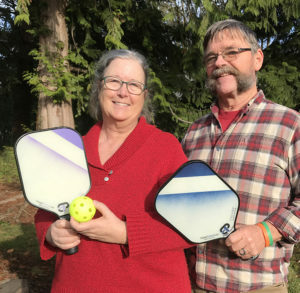 They couldn’t find a complete badminton set, but they had wiffle balls,” explained Poppy Shell, who along with her husband, David (and a few others), generated enough interest to bring the sport to Silverton. She continued to say the men who found themselves inventing the game out of necessity, carved out “composite paddles that were the same weight as ping pong paddles, only a bit larger.” Another story references the game being named after a dog named “Pickle.” Yet another mentions the name evolved from a “pickle boat,” a term referring to a boat of “leftover” rowers. “What we’ve noticed is that the good players are very gracious, and enjoy teaching and giving tips to the beginners,” David said. Poppy recalled watching a man with Parkinson’s disease play with relative ease. His tremors seemed to virtually disappear while he was engaged. The local couple, who have five children and 11 grandchildren, moved from Silverton to Kauai, Hawaii, in 1992 and stayed for 23 years. At that time, David was a building contractor and rebuilt hurricane-damaged homes. Poppy was the head costumer for all the theater groups on the island. “We got involved in pickleball when we lived there – it was everywhere,” she said. They returned to Silverton in 2015 and are thrilled the sport finally followed them back to their now-permanent neck of the woods. And interest is spreading. Silverton’s Senior Center is hoping to establish the game at their facility to foster more grandparent/grandchild interaction. Brandon Lemon, vice president of sports and aquatics for Family YMCA of Marion and Polk Counties, is happy to add a new sport to the program. Brandon added that on the first day, Dec. 27, 24 participants showed up, which included some players from Salem who helped set up. The YMCA will provide paddles, wiffle balls and nets. Players are encouraged to wear comfortable layered clothing and “gym-friendly” shoes with rubber soles. Thursday morning games from 10 a.m. to 12 p.m. will be free through Jan. 31. Starting Feb. 1, a $3 fee will be charged for drop-ins and non-members. YMCA and Silverton Senior Center members are free. For more information, contact the Silver Falls Family YMCA, 601 Miller St., Silverton. 503-873-6456.